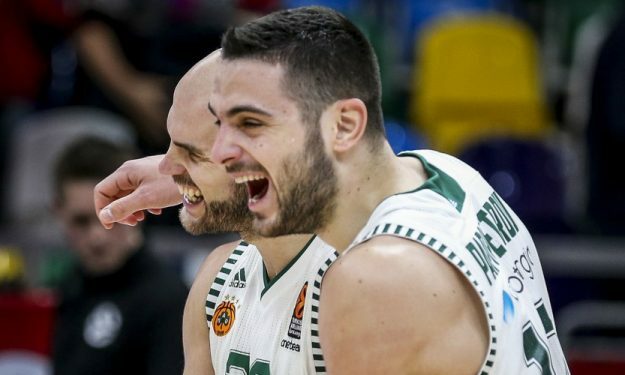 Thanks to a miracle three-point game-winner from Nick Calathes, Panathinaikos shocked CSKA and escaped Moscow with a vital 78-77 win, that puts the Greek team on a tie for the eighth spot of the league standings. After 37 minutes, the contest was a one-possession game (68-67). After a 6-0 run in the final two minutes, the hosts went up by seven points (74-67), but Panathinaikos was not done just yet. Thanks to DeShaun Thomas and Nick Calathes, the visitors had their own 7-0 run and tied it up at 74. Cory Higgins’ two clutch free-throws put the hosts up by two points (76-74). James Gist was fouled, tried to tie the game at 76, but missed a crucial free-throw. In the following possession, Will Clyburn missed another yet important free-throw and made the score 77-75, setting the stage for Calathes shot who finished the game with 11 points and nine assists. “It’s a huge win. We’re playing really good basketball now, getting better day by day and week by week. Our goal was to keep it close and try to win in the last few minutes, and we got lucky but it takes a bit of luck on the road to get a victory against a great team. We just said, don’t let the game get away, play it possession by possession, take your time, run your offense and we’ll be fine,” said Rick Pitino after the final buzzer. Thomas had 12 and James Gist added also 11. CSKA was playing without Nando De Colo, but Sergio Rodriguez had a big night with 23 points, while Higgins added 14. The game was close from wire to wire, as Panathinaikos was trailing by five at halftime (41-35) and the “Army Team” shot just 35.6% in two-pointers at home. Ioannis Papapetrou with 10 points and nine rebounds for a total of 22 ranking was the best player of Panathinaikos according to the numbers.